Montreal Alouettes' head coach Marc Trestman appears to have finally landed a big job south of the border. Trestman has been linked to every job from head coach with the Minnesota Golden Gophers to the Miami Hurricanes to offensive coordinator with the San Francisco 49ers or Carolina Panthers in the past without anything coming of it, but the rumours of his departure this offseason have taken on a new intensity, and they appear to finally have come true early Wednesday morning thanks to Brad Biggs' Chicago Tribune report that Trestman has been hired as the new head coach of the NFL's Chicago Bears. (RDS' Didier Orméjuste‏ has confirmed the report with a source of his own, suggesting this isn't a Jimmy Johnson exercise in premature speculation.) If this is accurate, Trestman's departure will be a substantial blow for the Alouettes, but it could actually turn into a tremendous positive for the CFL as a whole. First, let's consider the impact on the Alouettes. 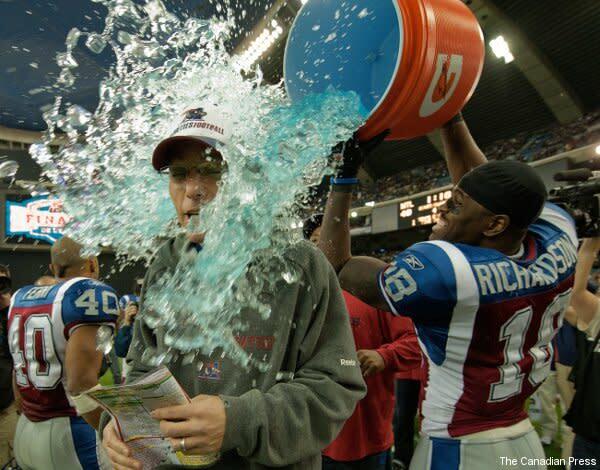 The Montreal dynasty goes well beyond Trestman, but he has played a key role in the elevation of the Als from a good team to a great one, particularly with the back-to-back Grey Cups he won in 2009 and 2010 (the first time any CFL team had done that since 1996 and 1997). It's notable that this kicks them into a head-coaching search long after every other CFL team's already decided on their boss (and at a time when most other teams have already locked up most of their key assistants). That's simply a function of the differing NFL and CFL calendars; many CFL hirings and firings are made after the Grey Cup concludes at the end of November, while most NFL firings aren't even done until that league's regular season wraps up in December, and the involvement of many potential candidates in the NFL playoffs often means that hirings are delayed. The Bears can't be blamed for that. The timing of this does make it tougher on Montreal, though, as there aren't a lot of top-tier candidates currently looking for jobs, and the CFL offseason is already in full swing. For example, free agency starts Feb. 15, and the team will absolutely need to have a coach in place by then to decide what personnel moves they want to make. Ideally, they'd have a candidate in place long before that so they could decide which players of their own to try and offer extensions. There aren't any internal candidates that really stand out as obvious replacements, either, as the Alouettes will have new coordinators on both sides of the ball this year thanks to Marcus Brady's departure for Toronto and Jeff Reinebold's firing (and replacement with Noel Thorpe). They'll have to undergo an extensive search, and they're doing so late in the game. What's particularly notable is that the Alouettes don't even necessarily know who will be running that search. Keep in mind that general manager Jim Popp has received substantial NFL interest of his own this offseason, and although he was eventually passed over in Carolina, he appears to still be a strong candidate for the New York Jets' job. (That could be particularly interesting, considering that he's already somewhat criticized Tim Tebow despite being the CFL GM who put Tebow on a negotiation list.) Popp's probably favoured to remain north of the border at least this year, but you never know what NFL teams are going to do, and he's received plenty of strong consideration so far. That raises the question of just how heavily he'll be involved in hiring Trestman's replacement. There's no dispute from this corner that Popp would do his best to preserve the future of the Alouettes even if he wasn't going to be around, but the new coach will have to work with whoever winds up as the team's general manager (and on that front, it's notable that assistant GM Marcel Desjardins, Popp's natural successor, is a serious candidate for the Ottawa job). Montreal may not want to make a decision on their head coach until they know if Popp will be back or not. While Trestman's departure is certainly a blow for the Alouettes, especially given the timing, it could be extremely beneficial for the CFL as a whole. There are plenty of reasons to believe that Trestman can be a good NFL head coach (consider the NFL and NCAA success he's had in the past, and in particular, the way he's turned lousy-to-mediocre quarterbacks like Scott Mitchell and Rich Gannon into extremely capable players), and if he does well with the Bears, that could be a huge boost for the CFL. Trestman's far more qualified than any other CFL coach to take an NFL head job right now, but him receiving that opportunity might open up a pipeline for others down the road. Much of the skepticism around the CFL comes from fans south of the border, and while a solid coaching job by Trestman might win some of them over, that's not the really crucial element here. The most important aspect of a CFL coach like Trestman finding major success south of the border (as Marv Levy and Bud Grant did before him) is how it would improve the perception of the CFL as a viable option for both players and coaches. The CFL doesn't need to be an NFL farm league, but having its best talent move on to the NFL and find success there (in both the playing and coaching ranks) reinforces that this is a legitimate football league, and that will help draw yet more playing and coaching talent up here. Thus, the Alouettes' loss could well be the league's gain.